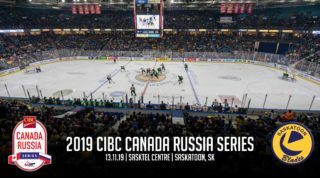 The Saskatoon Blades skated to a convincing 6-1 victory over the Moose Jaw Warriors on Wednesday night at SaskTel Centre. The win gives the Blades an 8-point lead over the Warriors in the East Division standings. Saskatoon (32-13-8-0) now sits just 4 points behind the Everett Silvertips for 2nd overall in the WHL. Kyle Crnkovic (6) opened the scoring midway through the first period thanks to a beautiful backdoor pass from Dawson Davidson, who extended his career high point streak to 11 games with the helper. 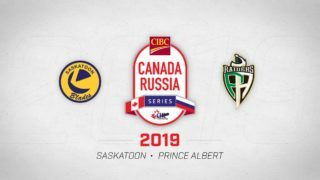 Then after being on the receiving end of a hit from behind along the end board, Saskatoon captain Chase Wouters (10) made it 2-0 for the Blades on the ensuing power play. 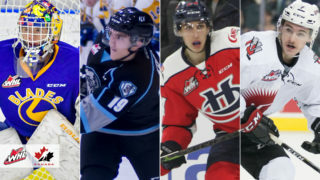 The goal marked the 100th career point in the Western Hockey League for the 18-year-old out of Lloydminster, Alberta. The Blades took the 2-0 lead along with a 21-5 advantage on the shot clock into the first break. 54 seconds into the second period, Ryan Hughes (21) found the back of the net with a backhand shot for his 20th tally of the season to put the home side up 3-0. Gary Haden and Nolan Kneen chipped in with the helpers. Finally the Warriors found a way to respond on the power play through Justin Almeida, who finished off a passing play for his 21st of the year. 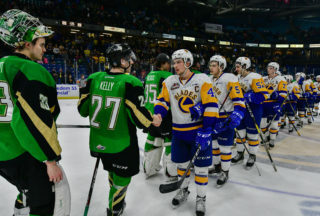 Later in the period during a 4-on-4 sequence, Kirby Dach found Riley McKay stepping out of the penalty box on what created a 7 second power play for Saskatoon. McKay entered the zone being pressured by a Moose Jaw defender before dropping off for Dawson Davidson (10) who beat Adam Evanoff upstairs to make it 4-1. Again the Blades dominated in the shot department taking a 34-11 lead into the second intermission. The final 20 minutes saw the Blades power play continue to execute with goals form Max Gerlach (32) and former Warrior Brandon Schuldhaus (6). Saskatoon finished the night 4/6 on the power play and 4/5 on the kill. Nolan Maier made 19 saves earning hi 26th win of the season, which puts him 3rd overall in the WHL win category. Chase Wouters scored his 10th goal of the season to hit the 100 career point milestone. The captain also went 18/25 in the face-off circle. Dawson Davidson extended his career high point streak to 11 games (2G-15A). Max Gerlach scored for a fourth consecutive game, also running his point streak up to 9 games. 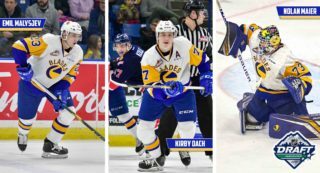 Kirby Dach had 2 assists and 6 shots on goal while drawing a major penalty late in the 3rd period resulting in the Blades’ 6th goal. 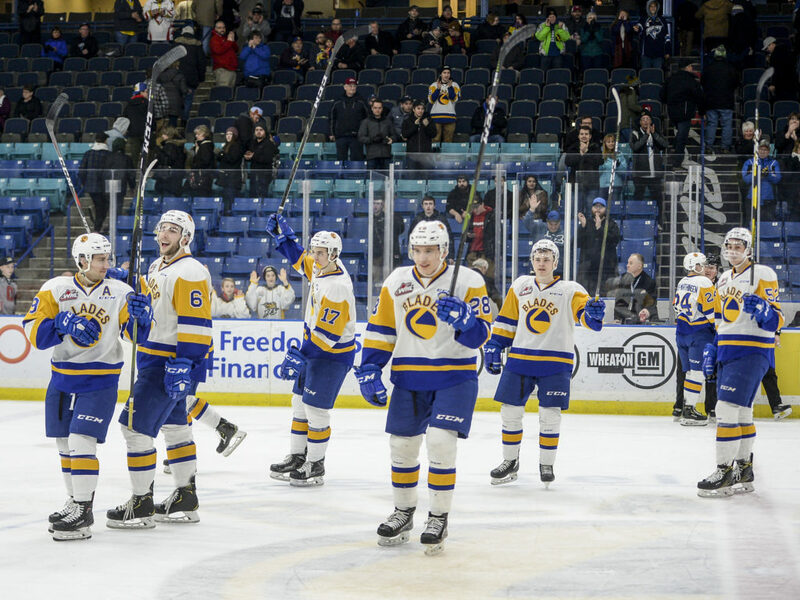 The Blades visit the Swift Current Broncos on Saturday night and then return home to SaskTel Centre to host the Brandon Wheat Kings for another Mosaic Family Sunday at 4:00pm.